This is the professor of astral travel with her familiar Pharoah Hound. There is debate over whether this breed originated in ancient Egypt. The breed club says yes based on the results of an archeological dig. Wikipedia says no DNA link between this dog (now national dog of Malta) and Egypt. Who to believe? A search of dolichocephalic canines on Wiki throws up long haired whippet. Er no such thing. Credibility dip there. And then there's the standard line that greyhounds are ancient but whippets a bantamised version originating in the nineteenth century. Wrong. There is a fourteenth century painting of the birth of Jesus with whippet type dog in attendance in our city art gallery. Can't find an image of it. Credibility dip for me. Whippets often known as poor man's racehorse, forever associated with the miners who raced them on Sundays. 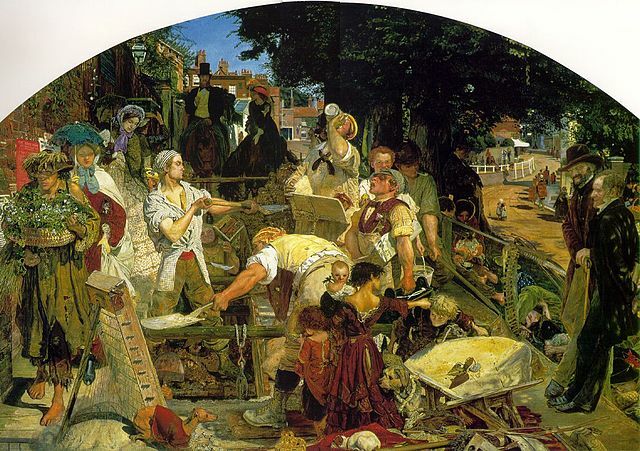 Yet in Ford Maddox Brown's painting the little whippet in red coat and gold collar is positioned as wealthy vis a vis the shaggy dog on a rope. Some kind of reversal going on here. One minor gripe about the hound in this card. The back legs and feet aren't right. Too stumpy and when airborne should be fully extended. This is one reason why it is good to have interests - it helps us see things with a critical eye. I'm inclined to believe the PH breed club on the origins - these people are interested to the point of obsession which means they do their research. Anyway I'm happy to get my hound card after months of buying decks featuring these breeds and a PH is a good choice for an astral flight dog. Credibility credit. Now they look like fun little dogs. Yes I can't think of another mammal that comes in so many shapes and sizes. I draw terrible dogs. :) Of course all the ones I've ever owned have been Heinz 57 varieties (mixed breeds)! Love her free-spirited animal art! Looks like she starts with character and takes it from there although I am no expert on these things.